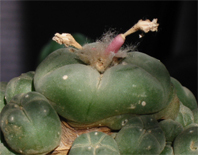 Just to let you know that I have set up a profile for the Lophophora Blog on Facebook along with a couple of pages. One of the pages more or less heralds all of the posts from this blog while the other, The Peyote Post, focuses on the traditional, indigenous use of the peyote cactus (to be honest I'm not exactly sure where to draw the line between the subjects covered on these two pages but figured they in general might cater to different audiences). I will also use these Facebook pages to link to subject matters that will be covered in detail on this blog later. This blog will continue to be my main platform - the Facebook presence is just meant as an easy means of letting Facebook users follow the blog.